THE MAJORITY of OuR RUM THAT WE USE FOR CUT RUM COMES FROM THE WORTHY PARK ESTATE IN JAMAICA. ITS RIGHT IN THE MIDDLE OF THE ISLAND BETWEEN KINGSTON AND OCHO RIOS - THEY HAVE BEEN MAKING QUALITY RUM SINCE 1720 AND THEY ARE VERY GOOD AT IT. THE DISTILLERY IS 366 METRES ABOVE SEA LEVEL AND THE ESTATE STRETCHES OVER 10,000 ACREs and they are one of only 5 estates stilL farming sugar cane and distilling rum since the last big drought that saw many others go under. CUT RUM IS MADE FROM ONLY THE FINEST NATURAL INGREDIENTS. OUR VANILLA AND OUR PEPPERCORNS ARE FROM MADAGASCAR - OUR CORIANDER SEED, CINNAMON AND ANISEED ARE SOURCED FROM SOUTH INDIA AND WE GET OUR NUTMEG FROM THE WEST INDIES. OH...AND THE LEMONS COME FROM OUR MATE DAVE'S GARDEN. 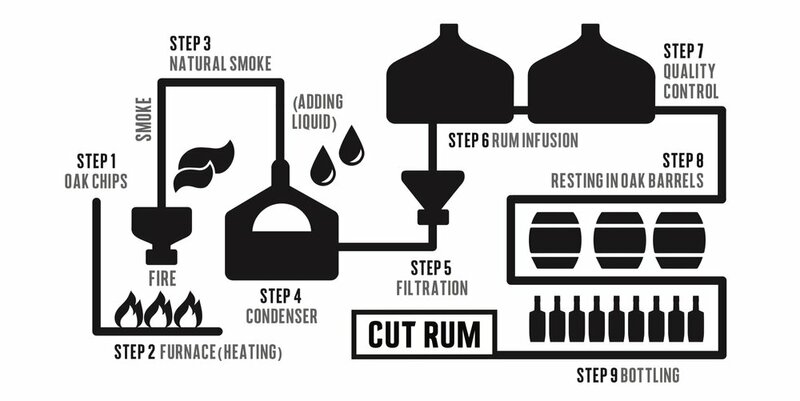 CUT SMOKED RUM IS ONE OF THE FIRST SMOKED RUMS IN THE UK. IT WAS A PAINSTAKING JOURNEY BUT AFTER 2 YEARS WE FINALLY CRACKED IT AND THE RESULT IS PRETTY SPECIAL! WE USE REAL AMERICAN OAK CHIPS AND BURN THEM IN A FURNACE TO RELEASE THE SWEET OAK WOOD SMOKINESS. AS WE BEGIN TO COLLECT THE SMOKE WE ADD SMALL AMOUNTS OF OUR 3 YEAR OLD JAMAICAN RUM AND FEED THIS INTO OUR CONDENSER - AS THE PRESSURE IS APPLIED WE START TO CREATE A STRONG NATURAL SMOKE CONDENSATE WITH A RUM BASE. WE THEN FILTER OUR SMOKE CONDENSATE TO GET RID OF ANY TOXINS AND CARCINOGENS AND WE ARE LEFT WITH BEAUTIFUL SUPER STRONG SMOKED RUM THAT WE THEN BLEND WITH THE REST OF OUR JAMAICAN 3 YEAR OLD WHICH HAS ALREADY BEEN INFUSED WITH ARABICA COFFEE BEANS AND NATURAL TOBACCO EXTRACT.